A True Health Care Innovation: "Hello, My Name Is..."
One of the most refreshing things about hospice and palliative care (HPC) is the person-centered focus of care. Many clinicians who discover palliative care are really drawn to this, because it gets back to the roots of caring for another human being. Add in a healthy dose of communication training and HPC clinicians are ready to jump into a patient/family meeting wherever they are needed. But what about the simple stuff? Now this started in the UK back in September 2013, and in 2014 the momentum has grown in the UK, and spread worldwide most notably in Canada, and Australia, but from my social media research it surprisingly has not been a big deal here in the United States*. But all of us...we can change that. We can help share Kate’s passion. We can start “Hello, my name is…” campaigns in our hospitals, nursing facilities, hospices here in the states. Make a commitment yourself on social media and encourage your health care friends to do the same. 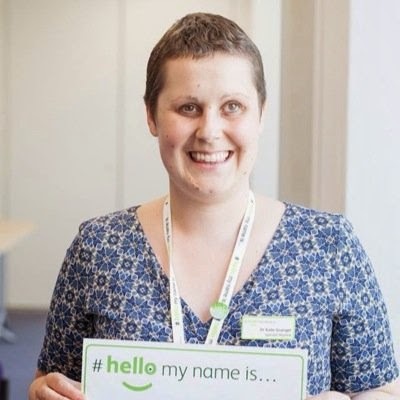 The hashtag #HelloMyNameIs very popular on Twitter with millions of impressions but mostly in the UK. Great ideas like this live to be shared and we have the ability to bring compassion back to the foundation of health care in the US. If your organization gets on board, please make sure to share it with @GrangerKate on Twitter or on her blog. If you let us know too, we will make sure to highlight some of the early adopters here in the United States. (If I missed that your organization in the US, did this a long time ago, let me know, I’ll re-edit the post!). If you are a health care social media influencer I challenge you to write about this and help make a difference in your own digital and IRL communities. When was the last time you were excited about something in health care? Like, change the world type of excited? Change your avatar on social media to "Hello, my name is..."
*I did find a well written post by Dr. Peter Pronovost at Johns Hopkins, but despite the post it doesn't appear from other searches Johns Hopkins took him up on the great shared idea.